The IHE Delft & Rotary Foundation water project & partnership workshop took place on September 7, 2018, and was jointly organized by IHE Delft Institute for Water Education and The Rotary Foundation. This international event at IHE Delft brought together people from various continents who are involved in water projects or have a particular interest in Water & Sanitation or Water & Peace. It provided the opportunity to meet and exchange ideas with IHE Delft scholars, professors, Rotary leaders and water experts from various countries. The unique presence of two Rotary Foundation Trustees as well as an incoming director elect of Rotary International (2019-2021) shows the great interest of Rotarians in water-related issues and especially solutions. The event started with a plenary session featuring keynote speeches from water professionals and Rotary leaders, kicking off the afternoon's programme. This video on the right hand side shows an unedited version of the plenary session. The YouTube version includes shortcuts to the various parts of the programme. In his speech Jan Lucas Ket, Rotary International Director 2019-2021, stated that he looks "forward to the involvement of districts in this partnership in the coming years, to guarantee a constant stream of Rotary-IHE Delft alumni to the world" and promises to promote the partnership in the Board of Rotary International. "Let there be no doubt, Rotary feels strongly about water and sanitation" states Per Hoyen, Rotary Foundation Trustee 2018-2022, when giving some statistics to back that up: "In the past three years Rotary Clubs worldwide implemented more than a thousand large sustainable water and sanitation projects in 83 countries, with a total investment of US$ 70M." Henk Jaap Kloosterman, Rotary host area coordinator, reminds Rotarians in the audience that they can become directly involved, not only through donations, but also as host counsellor. 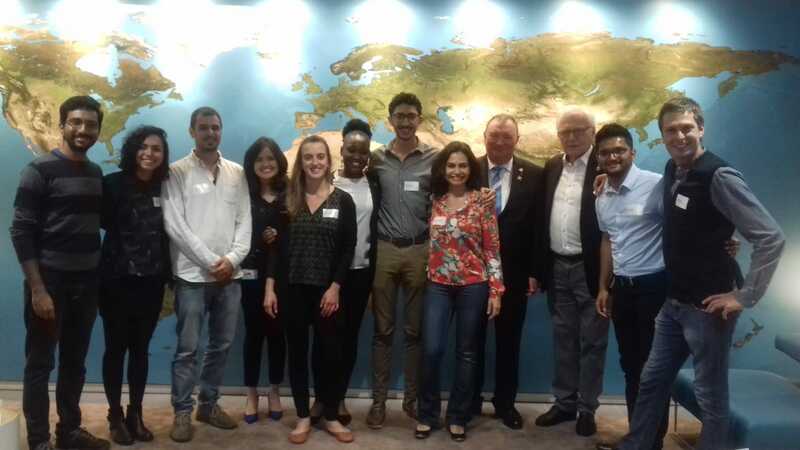 "Part of the success of the programme is that every student has an individual [local host] Rotarian who takes care of the student and sorts out some of the issues" that the students face during their stay in the Netherlands. In his presentation, Prof. Damir Brdanovic posed the idea of making IHE Delft alumni even more accessible to the international Rotary network through a knowledge management platform, allowing Rotary-sponsored alumni to be more easily involved with envisaged water-related Rotary projects. Later on, ideas elaborating on this topic were exchanged by all in the thematic session he led. Dr. Zaki Shubber presented the topics of Water & Peace, Governance and Diplomacy at the plenary session. During the interactive discussions it became very clear that within the realm of sharing of water resources, sanitation is a solution to problems, but to apply this, water governance (sometimes conflict resolution) is also vital, in order to implement such solutions. This was substantiated by the testimonials of the students' professional experience. The interactive thematic sessions that followed the plenary session included direct interaction with some of the Rotary-sponsored IHE Delft students. Connecting the Rotary network with the IHE Delft alumni network ensures the engagement of local water experts in Rotary funded projects. Some of the discussions in the interactive workshops were about practical ways to realize this, and it is expected that some of these ideas will be realized before the end of the year. Guests attending the event appreciated the organized tours of the building that showed how students are taught at IHE Delft, so that they can directly apply their new knowledge back in their home regions. They were also very impressed by the dedication, vision and level of the current Rotary-sponsored students. The Rotary Foundation established a partnership with IHE Delft in 2011, offering scholarships for talented students who would otherwise not be able to afford to study at the Institute. IHE Delft, the largest international graduate water education facility in the world, has proven to be a good match for The Rotary Foundation, the charitable arm of Rotary International, which has a strong tradition of providing global graduate scholarships.